Back to the estate lake for a short afternoon / early evening session with Jim and Mel plus a new bait – Dynamite Monster Tiger nut Red Amo boilies, plus matching glug and harden hook baits. I picked the harden baits to get 22mm (ers) to hopefully snare the larger girls. I explained to Mel these were designed for ‘monstrous’ carp hence the name. 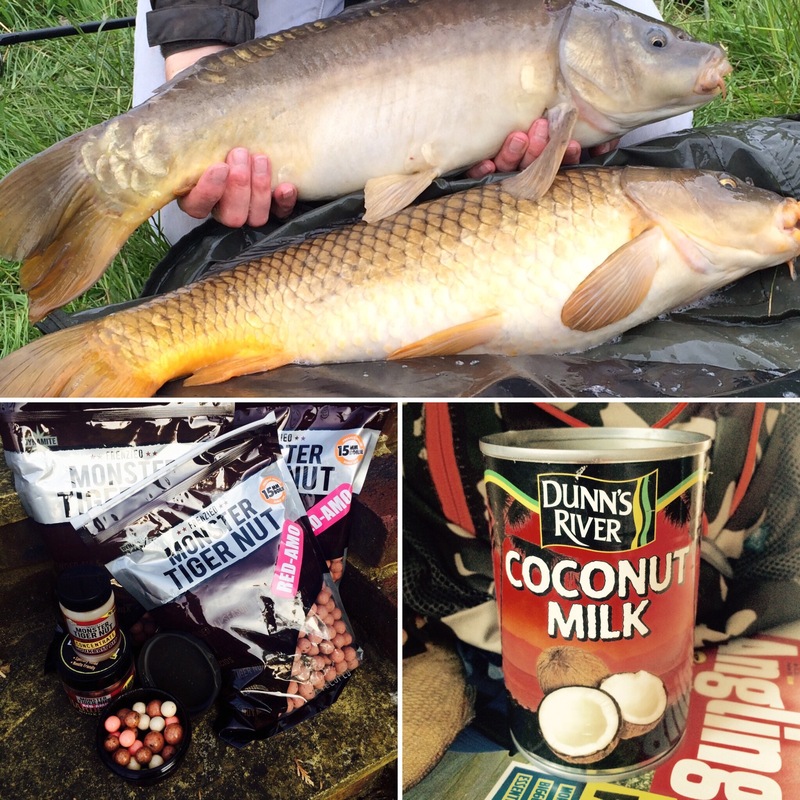 Either way the bait read well in reviews, in videos online and looked good (slightly washed out) so why not – having said that I could not resist my own edge, Dunn River Coconut Milk, half a tin per kilo. Now the snag from the previous visit was still fresh in my mind so I set up casting to “the” spot from a different angle and if I got a take the carp should arc left, and by keeping a tight(ish) clutch it should sail passed the snag thereby solving that little carppuzzle. Out went two different set ups. The KD (which I have great confidence in), drilled 15mm plus buoyant corn snowman style to produce a gently wafting (natural) presentation. Then scattered (that’s what happens when a seven year gets her hands on the catapult) 30 or so baits near the spot, kettle on, and then we settled down to watch the water. The more I think about this lake the less likely I think there is anything over 20lb. It’s quite shallow all over, probably only six feet at its deepest and having chatted to the bailiff, it was restocked about three years ago, high doubles are the most likely outcome. And finally, that snag is an old fence, posts and all. Just then the left rod bleeped into life and as predicted the carp headed for the fence line, slowing the clutch with my hand it swept passed the snag and headed for the margin to my left. I had to apply more pressure to get her around the trees and into the net – a good looking mirror. Great to get off the mark with a new bait. Mel fired out a few more coconut enriched boilies while the mirror rested. Then as I was breaking the net down the right rod left out a solid tone and something was taking line. Jim grabbed the rod and luckily this carp headed right along the reed line. Unhooking the mirror on the net I was then able to net Jim’s common as it came in easily. Sweet – two upper doubles but no monsters to match our baits from Dymamite. Not sure if we’ll be back but I’m confident these boilies will solve the carppuzzle and produce good fish wherever we next visit.